It is observed with alarm that the holding of dances by the Indians on their reserves is on the increase, and that these practices tend to disorganize the efforts which the [Department of Indian Affairs] is putting forth to make them self-supporting. -Excerpt from a letter written December 15, 1921 by Duncan Campbell Scott, the Deputy Superintendent General of the Department of Indian Affairs as a circular to staff. “Red Sky is a creature of flight. It has wings – it can cross all kinds of boundaries,” says Sandra Laronde of the dynamic company she founded in 2000. Since its inception, Red Sky has been actively shaping contemporary Aboriginal performance with the creation and production of original works that add to the breadth of what Canada has to offer. It is difficult to capture on paper the grace of Laronde. She is passionate as she describes Red Sky and her vision for the company. Laronde thinks laterally, and seeks to take Red Sky into every performance venue possible, be it as large at the National Arts Centre and the Kennedy Centre, or a smaller venue like the Native Canadian Centre. She thinks on an international level, and works to bring indigenous people of the world together in artistic production. A visionary, Laronde derives inspiration from the simplest of moments. Standing in a monarch butterfly sanctuary in Mexico, a butterfly landed on her shoulder. Immediately she thought 'dance’. Struck by the beauty and resilience of the monarch, Laronde felt that the butterfly was an excellent metaphor for the indigenous peoples of Canada, and of Mexico. She set about to create a production that included the pre-Columbian indigenous music of Mexican composer Antonio Zepeda. 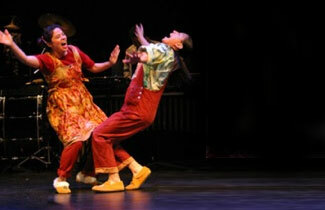 The production, Dancing Americas, premiered in 2003 to rave reviews and was recently sold-out to a capacity house at the National Arts Centre Theatre in Ottawa. Caribou Song came to fruition after having dinner with Tomson Highway. This story, written by Highway is about two Cree children living in Canada’s North, who follow the caribou by dogsled with their family. Caribou Song is collaboration between Aboriginal performers and a chamber ensemble of live music. When it was initially performed, Caribou Song featured a full orchestra and then a chamber version was created so the show could travel to more remote and rural areas and overseas. To date, over 20,000 people have seen Caribou Song. Like the migratory creatures the play is based on, Caribou Song has traveled from Toronto and Ottawa to British Columbia and California, and beyond. This fall, Caribou Song and Raven Stole the Sun will be performed at the John F. Kennedy Centre in Washington D.C. through the Smithsonian Institute. As Laronde says, “Red Sky is for everyone.” That is to say, people of all ages and backgrounds, whether living in urban or rural communities. Laronde seeks to bring Red Sky performance to as many people as she can, and dreams of a circumpolar tour of Caribou Song, bringing it to places like the Yukon, Greenland, and Russia - all places that strongly associate with the caribou. Red Sky has only existed for four years, but has accomplished a great deal. With three productions touring, as well as the success of August’s Red Sky at Night, a spectacular performance at the Carlu, and several performances slated for the coming months, the young company is busy. But Laronde still has time to come up with ideas for new productions. She has four ideas she’d like to make happen in the coming years. When asked about the accomplishments of Red Sky Laronde said, “The fact that Red Sky exists and does different, creative projects is an accomplishment. It is revolutionary to show beauty, resilience, strength and power in spite of the atrocities that Aboriginal people have faced.” Laronde tells me about a letter written by Duncan Campbell Scott, of the Department of Indian Affairs in 1921. This letter (excerpted above) was circulated to government staff encouraging that all forms of dance and ceremony be stopped. “Stories, dances, sacred scrolls – and entire cultures – and traditions went underground during this time”, says Laronde. Laronde’s response to this attempt at the suppression and assimilation of a culture is to create, and to dance, and to celebrate beauty in the face of such oppression. If the first four years are any indication, the future of Red Sky is indeed very bright. In addition to creating new performances and continuing to tour to already established performances, Laronde hopes to continue to collaborate on an international level. “Red Sky is about working with everyone – I seek to create a company that is inclusive rather than exclusive,” says Laronde. There is no doubt that Laronde will achieve her goals, and beyond.